The historic cathedral city of Salisbury in Wiltshire is served by the GoAhead South Coast bus company of Wilts & Dorset. The original Wilts & Dorset Motor Services started operations back in 1915 and operated until 1972 when it was merged with neighbouring Hants & Dorset. The Wilts & Dorset name then reappeared in 1983 when Hants & Dorset was split up prior to deregulation. The subject of this video programme is the current company seen when we make two visits this beautiful city. 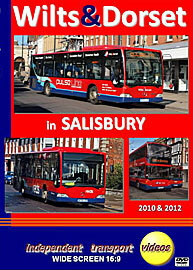 Our filming starts in the spring of 2010 prior to the recasting of most of the Salisbury bus services and the branding of the local services as ‘Salisbury Reds’. We see branding like ‘Pulseline’ on the vehicles, as well as the second deregulated livery with the strap line of ‘Serving Countryside and Coast’. The first location is at the busy bus station where we see early morning arrivals from all over the territory. Our cameras then take up various locations across the city to film the vehicles in action. Locations featured, include Blue Boar Row, Minster Street, Bridge Street and Castle Street. We also venture out to the pretty village of Wilton to see a number of Optare Solos in action on routes soon to be changed. Back in the city centre our filming continues along New Canal, Brown Street and Exeter Street to name but a few. We conclude this visit with a brief look behind the scenes at the bus depot in Castle Street. The second part of this programme is filmed in the spring of 2012. Again we start at the bus station to capture the action of Wilts & Dorset and also Stagecoach buses working in from Andover. Moving into the city centre we are able to film the ‘Salisbury Red’ liveried buses, some of the MPD Dennis Darts have been transferred from the sister companies of Bluestar and Southern Vectis, all adding to the rich tapestry of buses that can be found in Salisbury. We have used similar locations as in the 2010 visit and this adds an interesting comparison in how much things have change in just two years. At the time of filming the fleet was undergoing a complete renumbering – this also adds a good deal of interest to the viewer. With further visits to the bus station we conclude our filming on Castle Street. There will be further programmes featuring Wilts & Dorset coming soon, Salisbury is just the first in a series that we hope you enjoy.